The Robinson R22 Beta II is a two-seat small rotorcraft powered by a single Lycoming O-360-J2A four-cylinder, air-cooled piston engine. 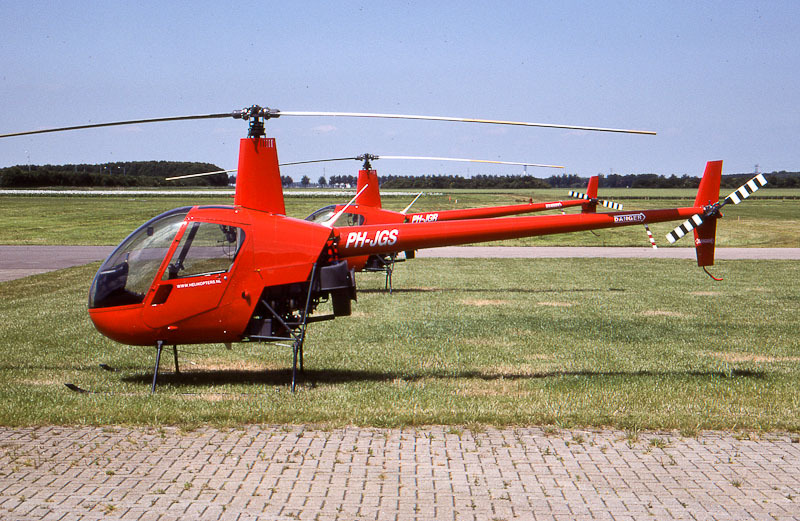 The R22 was designed by the founder of the Robinson Helicopter Company, Frank Robinson. Design of the Robinson R22 helicopter began in 1973, and an 85kW (115hp) Lycoming O235 powered prototype flew for the first time on 28 August 1975. A second followed in early 1977. The FAA certification was achieved on 16 March 1979 and deliveries started in October of that year. On 5 August 1985, the Beta model was certified. The R22 Beta had a larger oil cooler and associated installation changes were made to permit the 131 hp. takeoff rating with the O-320 engine. In 1995, the R22 Beta II model, with the Lycoming O-360-J2A engine installed, entered production. This engine is installed on s/n 2571 and subsequent in production. Over 4600 Robinson R22 helicopters are delivered to customers all over the world. On 25 June 1999, the 1998-built Robinson R22 Beta II PH-JGS was seen with 'WWW.HELIKOPTERS.NL' titles at Lelystad Airport in the Netherlands. On 18 June 1998, Robinson R22 Beta II c/n 2817 was registered PH-JGS in the Netherlands with J.W.G. van der Steen, Epe. On 15 April 1999, the helicopter was registered with Lelykopters BV, Lelystad, as holder and J.W.G. van der Steen, Epe, as owner. On 22 March 2003, Robinson R22 Beta II PH-JGS was heavily damaged when it rolled onto his left side while practicing "pedal less" landings at Lelystad. On 17 September 2004, registration PH-JGS was cancelled as the helicopter was damaged beyond repair. After this Beta II was de-registered, the aircraft was on static display with the indoor Paintball and Lasergame Arena Twenthe in the Starworld Hal in Enschede. On 7 January 2007, the airframe was destroyed when the Starworld Hall was destroyed by fire.